In between all the tastings, trips, tours, dinners, breakfasts and late (late!) nights, the meat-and-potatoes of the conference was all about learning. From the experts, other bloggers, industry people and winemakers, in one- and two-hour chunks of brain-buzzing intensity. That's one thing I was really hoping for that I found lacking at the conference: a basic "Blogging 101" for noobs, some techie "how-to" session that shows me how to do this thing right. (And maybe a little something about Google Analytics, since I was clearly clueless on that front.) Nevertheless, there was no shortage of information being shared and I soaked up as much as I could. Creating Compelling Content - What is compelling? What gets the reader's attention? Who are you writing for, and what do they want to read? These were the critical questions being asked of and answered by panellists Michael Wangbickler, Jeanette Montgomery and Marcy Gordon. It's all about crafting the right combination of words to grab readers and keep them coming back for more. Originality and personal experiences are key. Gordon cautioned against just posting tasting notes and regurgitated information from other sites. "Take scholarly content and put it through the cotton gin of YOU," she said. "Readers are living vicariously through you." That put emphasis on the importance of knowing one's audience, and writing for that audience. "Check your previous posts - which one has the most hits? That's your audience," said Gordon. Positioning Your Blog - Nothing beats more traffic to one's blog (unless you're like me and mysteriously getting hits from some eastern European site shlepping all things unsavoury. *THAT* I could do without.) Thea Dwelle (THEE-ah DWELL-ee, if you please), Megan Kenney and Kathleen Rake gave us a rundown of what makes a blog stand out in the crowd, and how networking―both online and in real life―can make or break your blog's success. There were some conflicting messages about optimal word count (brevity for short attention spans vs writing as long as you need to tell the story), but all three panellists agreed on the Boardroom (LinkedIn), Barbeque (Twitter) and Family Reunion (Facebook) social media approach to 'selling' your blog. And Kathleen had the best advice of all: "Don't beat yourself up if life gets in the way (of blogging). This isn't paying your bills. Aim for quality, not quantity." Truth! 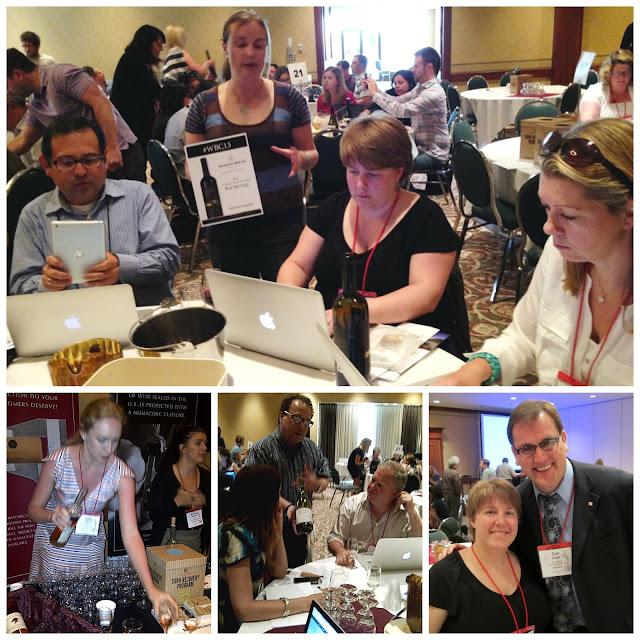 Live Wine Blogging - This was fun. Speed dating for wineaux, where marketers and winemakers shmooze as much as possible in a five-minute stretch while you swish and spit their wine. Then the buzzer goes, the next presenter comes to the table and it starts all over again. Having 'been there done that' before, I had a thoroughly a grand time in the midst of all the chaos. I'll admit to having played hooky during some of the Sunday morning sessions when both brain and palate were at capacity. Instead, I explored the vendor stalls and main-street shops of Downtown Penticton (after a marvy breakfast in the park hosted by same.) There, I met some of the gracious, friendly and generous citizens who had enthusiastically flung open their city's doors and hearts to welcome us wine bloggers. That's something everyone should take the time to do during any conference. Learn a bit about the host city and say 'thanks'. It doesn't take long ... but it means more than you know. Great post Bethany. I found a few helpful tidbits here. Oh, and I use Google Analytics and all it does is drive me a little crazy watching numbers. Nice post! I think you should lead a panel next year in Santa Barbara on “Getting the Most of Your WBC Experience” you’d be great. "Nice post - I agree with marcy - you would be great. This post takes me back to the conference - and you quoted my boardroom / BBQ / family reunion comment! :)"
Thanks for the mention, Bethany. I'm glad you got value from your first WBC. I've been attending since 2009 and I always come away a little richer in knowledge, and friends. Speaking of that, it was great to meet you and welcome you to our little corner of the wine world. I'll add my voice to Marcy and Leeann's: Get thee on a panel for 2014!